A book about a battle in the Russo-Turkish war of 1877/78 might not seem perfect fodder for a site dedicated to Imperial British history and yet the more you learn about this battle, and the general who fought it, the more you realise that it is a perfect encapsulation of Britain's soft power and influence at the midpoint of Queen Victoria's reign. The book also points out some of the more bizarre idiosyncrasies and moral values of the Victorian era which ended up seeing one of Britain's most promising cavalry officers forced out of the British Army and fighting for the Sultan of the Ottoman Empire against the Russians. In truth, this is not merely the history of a battle nor even a straightforward biography of a person, rather it is really a story about redemption or at least the quest for it. It is the kind of story that might seem too far fetched for a big-budget film but as is so often the case the truth can be far more compelling than fiction. Few people's careers can have plumbed the depths and climbed the heights as spectacularly as that of Valentine Baker. His life started off so promisingly with something of a quintessential imperial background. His grandfather, who Valentine was named after, had been a hero of the Royal Navy fighting against the French in the previous century and had used his prize money to buy plantations in Jamaica and in Mauritius. These imperial holdings, which included slaves until they were abolished in 1833, would lay the foundation for the family's prosperity into the future. It was to two of his older brothers that the family fortune was to be entrusted to and Valentine, along with a younger brother were bought commissions to serve in the British Army. However, before entering military service, Valentine joined his two older brothers in Ceylon when they saw the potential there for expanding their holdings in the promising highlands of Nuwara Eliya. It is here that Valentine first saw military service with the Ceylon Rifle Regiment. In hindsight, this proved to be a fortuitous turn of events as it gave him the experience of serving with Muslim soldiers, largely Malays, and to appreciate the importance of respecting their ethnic and religious customs in helping to get the best out of the soldiers. These would prove invaluable skills later on. As luck would have it, his career in the British Army could start in nearby India as his regiment, the 10th Hussars, were posted there. There then followed a fascinatingly diverse military career seeing active service in Southern Africa and the Crimea (alongside the Ottomans of course). It should be pointed out that as this was occurring his older brother, Samuel Baker, was busily beginning his own remarkable imperial career as an explorer in Asia. Samuel Baker would become far more famous than Valentine due to these intrepid explorations in Asia and then later in Africa. More interestingly still is how Samuel served the Ottoman Sultan for a period in the 1850s and even married one of the Sultan's subjects who was destined for life as a slave. She would later be famous, as Florence Baker, for joining her husband on his arduous journeys through some of the most inhospitable places imaginable. Just to seal the imperial connections, the younger brother James would emigrate to British Columbia taking an active part in its politics there. As I said, this was quite the imperial family! For a while it seemed as if Valentine's career was destined for the highest of heights in the British Army as he wrote (The British Cavalry, 1858) and lectured on cavalry tactics and ingratiated himself into the Prince of Wales' 'Marlborough House Set'. He went as an official observer to both the Austro-Prussian and the Franco-Prussian wars - where he saw for himself the increasing utility of firepower rather than cold steel due to the improved breech-loading rifles coming into common usage. He also took a leaf out of his older brother's book and travelled to Central Asia and Persia to observe for himself the growing Russian influence in the region and to consider possible British responses as the Great Game which was by then underway in earnest. The author does point out later in the book, when giving a very useful overview of the Russian and Turkish military cultures, why the Russians were so successful in expanding their power in Central Asia. This was largely a byproduct of the nepotism and corruption in European Russia. All the most sought after postings in Europe were taken by the sons of royalty and aristocrats whilst any 'professional' soldiers had to make their careers in the less prestigious but far more adventurous Central Asian postings. In many ways it was their Wild West - or should that be Wild South-East from the Russian perspective - and any soldiers with intelligence and aptitude were far more likely to be found here. It is interesting perspectives like these which help reveal the wider imperial implications for the British of this deep-seated Russian - Turkish rivalry. The British were happy to see the Ottoman Empire as a bulwark to growing Russian ambition and Baker's journey to Central Asia helped establish his credential as an expert on these matters as his book Clouds in the East testified. So far, his career seemed so mapped out in front of him, until that is, it all came tumbling down due to a train journey in a compartment with a young lady in 1875. The fall was spectacular although the circumstances, as the author makes clear, are still somewhat shrouded in confusion and speculation. However, something strange and untoward did happen in that carriage of that there can be little doubt as the train hurtled several miles with a young lady hanging on for dear life on the footboard of Valentine Baker's carriage and arriving at the station in a dishevelled and terrified state. This was definitely more than a 'he-said, she-said' difference of opinion as to what occurred in that cramped space and the author tries diligently to piece together the possible sequence of events. However, the morals of the era combined with the silence of the accused to shed infuriatingly little light on to what actually occurred on that journey. It does seem as if Valentine Baker did confide to his brother and two others what actually transpired, but they kept their lips sealed so we are none the wiser. However, what we do know is that his fall from grace was real indeed. He was sentenced to 12 months imprisonment and he would be cashiered from the army. His prison sentence may have counted less to him than his dismissal from his beloved army but at this point his association with the Prince of Wales would count against him. Queen Victoria was less than enamoured with her son's profligate lifestyle and the 'Marlborough Set' company which he kept. She seems to have taken a visceral dislike of Valentine Baker almost certainly because she felt that it was immoral men like him who had helped make her son such a disappointment to her. This royal hostility to Baker would follow and frustrate him for the rest of his life. The Prince of Wales was able to do one more favour for his old friend upon his release from gaol in 1876. He put in a good word for Valentine with the Sultan of the Ottoman Empire and got him the role of Major General to reorganise the Ottoman Gendarmerie. This is a perfect example of Britain's soft power at that time and also the influence of royalty and not just within Britain but across ruling dynasties. At this time, Britain was worried about Russian expansion towards the Eastern Mediterranean as well as towards the Raj. The timing of Baker's appointment would prove with hindsight to have been fortuitous indeed. Pan-Slavism was on the rise and Russia was using this new nationalism to its own advantage and to destabilise Ottoman power throughout the Balkans. The rather cack-handed response by the Turkish authorities in putting down these early revolts and rebellions nearly had fatal consequences for the Empire. Firstly, stories of Turks committing atrocities towards Christians in places like Bulgaria made it more difficult for the British government to come to the aid of the Ottomans diplomatically and militarily. Indeed, these atrocities formed the backbone of Gladstone's famous Midlothian Campaign and helped bring back the Liberal Party from political oblivion after its disastrous 1874 result. Secondly, these atrocities helped create an excuse for the Russians to come to the rescue of their fellow Christians which is precisely what they did in 1877. The Russo-Turkish War is certainly one of the lesser known and under-appreciated of conflicts in the Nineteenth Century. The author does a fine job at analysing the strengths and weaknesses of the two military machines that would face each other in the Balkans. In many ways, they were surprisingly similar in that they both had inefficient officer corps laced with nepotism and corruption. They both were multi-national empires with a diverse range of soldiers and nationalities fighting under their banners. And the soldiers of both armies were far more resolute and determined than their officers had any right to expect. One of the surprising things I learned was that the Turks were actually better armed and had more up to date equipment than the Russians. They also relied on firepower more than the Russians who were still wedded to the concept of charging the enemy and using the bayonet to dominate the battlefield. Unfortunately for Baker, the exception to the rule of the Russians being less well armed than the Turks was to be their Guards regiments - which of course would prove to be the units that he would face at his Battle of Tashkessen! The flip side though was that their doctrine of charging and engaging the enemy was still very much in vogue even in these elite units and the terrain at Tashkessen would allow Baker to take full advantage of this Russian predilection for advancing to contact. The book does suggest that Victorian attitudes to who was on the right side or the wrong side of a conflict were highly fickle indeed. British public opinion which had been so hostile to the Ottomans over their treatment of the Bulgars so recently, seemed to switch allegiance over the siege of Plevna by the plucky Turks! It seems as if the plight of the underdog combined with suspicion and nervousness of the motives of Russian ambitions allowed British public opinion to shift back towards the side that Baker was fighting for. The author gives a comprehensive overview of this understudied war and helps put the Battle of Tashkessen into its context. In many ways, Tashkessen was only ever a sideshow of this war and the success hard won there was pretty much squandered later. Although, that should not take away from the significance of the leadership displayed there. The battle was only ever a delaying action in order to give the main Turkish force time to escape a giant Russian flanking manoeuvre led by some of the best trained and best equipped troops in the Russian army. Outnumbered at least 8 to 1, Baker had no illusions that he could defeat the Russians - that were never his aim. His job was to delay the Russians long enough to allow the rest of the army to escape. As the author reminds us, military retreats are some of the most difficult operations to conduct and fraught with dangers and difficulties. Baker though was able to use his lifetime of military experience in combination with the surrounding terrain and the troops available to him to provide an almost perfect textbook example of a holding action. The account of the battle is compelling, in many ways it feels as if the destiny of Valentine Baker was always heading to this point in time - all the good and the bad that put this man on this battlefield at this point of time against this Russian enemy with this Turkish multinational army all coalesced into a few days in a harsh winter in Bulgaria. He knew precisely when to hold and when to fall back. He used the terrain masterfully to provide cover for retreating units and mapped out his extraction with exquisite precision. He knew which troops he could depend upon and which he could not. He motivated when required but delegated when necessary. It is little wonder that Wolseley insisted on teaching and lecturing about the battle to British officers in subsequent years to illustrate how to conduct such an operation. 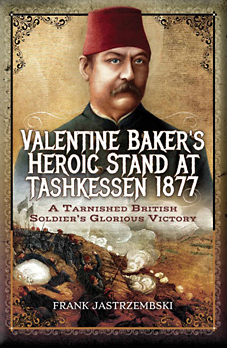 The victory definitely caught the imagination of the British public back home as all those who participated and witnessed it were only too keen to share their admiration for the action and for the role of Valentine Baker himself. The battle helped propel Jingoistic attitudes towards war and may well have helped convince the Russians not to press their luck too hard in advancing to Constantinople and push an increasingly belligerent Britain into war against her with unknown consequences. Certainly the Sultan of the Ottoman Empire was thankful enough for British support to grant Britain the colony of Cyprus as a symbol of his gratitude. Of course there was an ulterior motive in this gift in that he hoped that it would keep Britain engaged in the Eastern Mediterranean and so on call to help her again in the future if necessity demanded it. Interestingly, the lack of British intervention may in turn have amplified appreciation for Baker's victory as the only vicarious British-related action of the war. To many it confirmed the intrinsic superiority of British officers. Unfortunately for Baker, all his public adulation cut little ice with Queen Victoria who still seems to have retained her enduring grudge against him. All attempts to have him re-instated to the British Army foundered on her opposition. Baker's attempts at redemption would continue in the service of yet another Middle Eastern potentate after the British became involved in Egyptian affairs after 1882. Once again he was employed to organise a gendarmerie - the Egyptian one this time - but only after attempts to have him put in charge of the Egyptian Army were once again vetoed personally by Queen Victoria lest he find himself in command of British Officers! Baker seems to have earned back his reputation from nearly everyone except the person who mattered the most in the British Empire; Queen Victoria. There was to be more misfortune for Baker as the Mahdi swept much of the Egyptian presence in Sudan away and a hasty despatch of Baker with his as yet untrained Gendarmerie ended in disaster at El Teb near Suakin. Yet again though, he showed his strength of character by attaching himself to a successor British expedition and displayed extraordinary bravery in a subsequent and earned himself a serious, although not fatal, head wound as a result. The last few years of Baker's life were professionally successful whilst being personally increasingly forlorn. The Egyptian Gendarmerie was indeed reorganised and modernised and became an increasingly reliable formation alongside a professionalising Egyptian military machine. However, he lost both his daughter and his wife to typhus and returned broken hearted to Egypt after a final visit home. The lobbying for his return to the British Army had continued from well wishers and friends and after the death of his loved ones even Queen Victoria's heart seemed to have softened towards him. She finally granted him permission to rejoin the British Army. However, in the last poignant twist to Baker's unhappy career, he would die in Egypt before the news of his re-instatement reached him. More than a few felt that he had died of a broken heart. This book tells a remarkable story of a remarkable man. It illustrates how high the bar was for Victorian conceptions of an 'Officer and a Gentleman'. Whatever Valentine's faults were and whatever happened in that train compartment, few could fail to be moved by the lengths he went to in an attempt to redeem himself. He seems to have been a genuine loss to the British Army and one cannot but help wonder if they would have been better prepared for wars on the North-West Frontier or in South Africa had he risen to become the head of the British Army. But Britain's loss was to be the Ottoman Empire's and the Egypt's gain. These new endeavours help reveal just how far Britain's imperial tentacles weaved in the mid to late Victorian era. Valentine Baker may have been a flawed man but he is no less interesting for that and his exotic career was very much the product of the British Empire and its perceived allies and enemies. Frank Jastrzembski's book is a well organised book. It has an index, bibliography, plenty of illustrations and maps. It even has some modern illustrations which was a nice touch. The maps are certainly good, but I would have preferred a few extra or perhaps more detailed ones - on more than a few occasions I found myself looking for various villages and towns in vain as I tried to follow the course of the various campaigns and battles. There was one strange printing issue in the book in that the combination of the letters 'fi' always seemed to be followed by a noticeabley wide space. This had the effect of making it effectively break words. It is only a cosmetic issue but it was quite pronounced. The author does go on to provide some interesting rearguard battles in the final chapter to compare the Tashkessen action with. I found this a very interesting and innovative touch. I suppose it helped turn the book from one about a single individual in a single battle in a single war into a much wider military context about this particular style of battle. Retreats and holding actions can be vital but are all too frequently overlooked as they are often associated with eventual defeat or setbacks. This does not make them any the less fascinating and probably more so - look at how we revere Rorke's Drift for example. Had this battle been fought by British troops rather than Turkish ones, it almost certainly would have joined the pantheon of glorious British military actions, perhaps alongside of Rorke's Drift, The Siege of Lucknow or the Glorious Glosters at Imjin River. Tellingly, the author alludes to the Spartan stand at Thermopylae and it seems as if the Battle of Tashkessen does indeed deserve to be held in such illustrious company. I for one am certainly glad that I now know about this battle and thank the author for bringing it back to the attention of a modern audience.